Rock Hill Out to Obliterate it's Heritage - Historic Book House Threatened with "Redevelopment"
U-Gas Hill (Rock Hill) is at it again! The city that approved having it's historic namesake, Rock Hill Presbyterian reduced to a pile of rubble and shipped off to Warren County, where it has yet to be re-built, is poised to possibly eradicate another piece of it's history just down the road from the new U-Gas station. 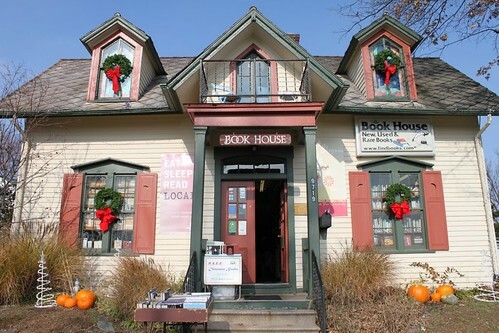 The Book House is an independent book store that for 27 years has been located in an circa 1863 Gothic Revival style house, one of the few surviving in the St. Louis area. The Book House is located at 9719 Manchester, about a third of a mile west of the intersection of McKnight / Rock Hill Road where the U-Gas went up last year. 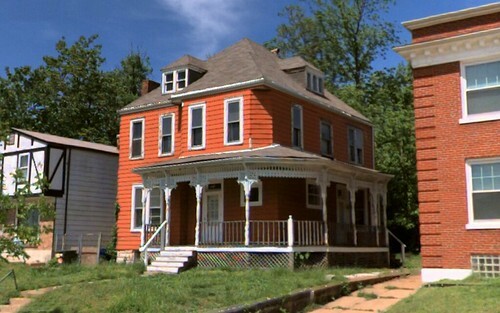 The house faces Manchester but is located on a parcel off of Leonard Avenue and is as accessed off Manchester through another property. 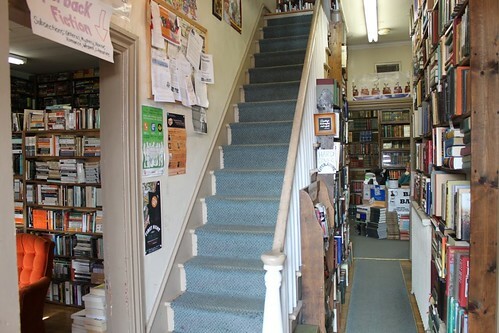 The Book House is designated as a historic landmark by the City of Rock Hill, but next Tuesday, May 7th, the Board of Alderman will consider approval of a proposed redevelopment by Great Northern Land Co. of Michigan that would demolish the historic Book House and several surrounding properties and replace them with a self-storage facility. Unfortunately the Book House does not own the historic house. Michelle Barron, owner and founder of the business said they had tried to buy the house in recent years, but with tightened lending standards they were unable to get a loan to do so. 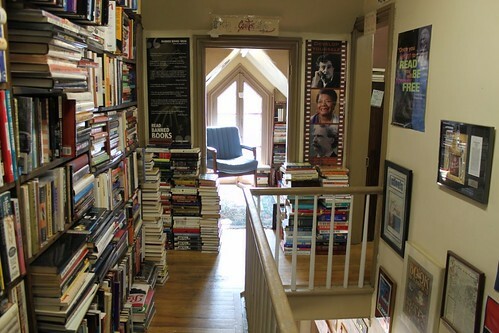 A supporter of the Book house started a petition on change.org to save the Book House, which is where I first learned of the issue this past weekend. Please sign the petition and share it with friends. Please email the Mayor of Rock Hill and members of the Board of Alderman asking them to preserve their heritage and to oppose demolition of this historic house. If you are able to, please attend the Board of Alderman meeting on Tuesday, May 7th at 7 pm at Rock Hill City Hall, which is located at 320 W. Thorton Avenue, east off Rock Hill Road just south of Manchester. Also, please like the Book House page on Facebook to stay updated. UPDATE: A story on stltoday.com is now saying that Rock Hill's Planning & Zoning Committee may not see the proposal until June. Another story on examiner.com has Rock Hill's assistant city planner saying that the developer has not yet applied for re-zoning. It is never too early to email and call Rock Hill officials though to let them know your opinions. 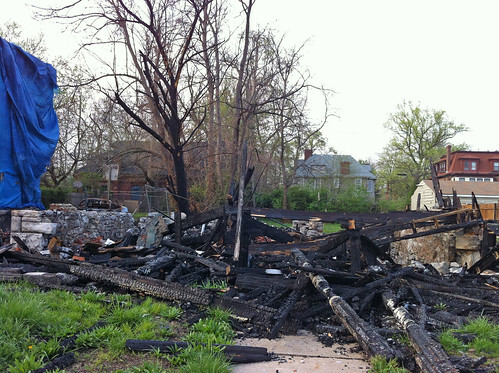 Last weekend while I was running in the West End neighborhood I was stopped cold by the sight above... the remains of a historic house at 6013 Cates that had literally burned to the ground. I recalled that this was the location of a Queen Anne Victorian painted bright orange with an incredibly intricate wrap-around porch. One of several frame houses on this block in the Hamilton Place Historic District, this home had been built by G. T. Parker in 1893. A view of the house, which was occupied and seemed to be well cared for. A close-up of the remains. 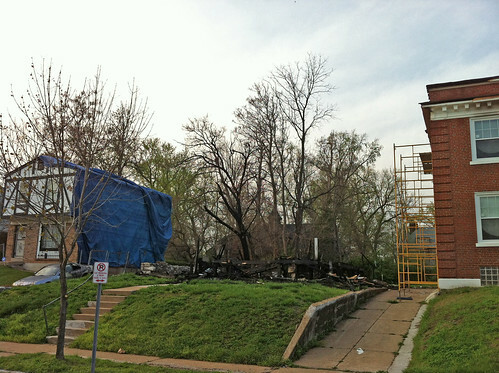 The HUD section 235 house adjacent to west obviously suffered damage covered by the blue tarp. On the other side, a renovated 1909 home by A.A. Fischer also sustained damage to the cornice, the projecting portion of which wraps all the way around the house. From the front it is apparent that the house suffered smoke damage at the second floor. Fortunately, the house has no windows facing west except two small openings infilled with intact glass block, or the damage could have been far worse. 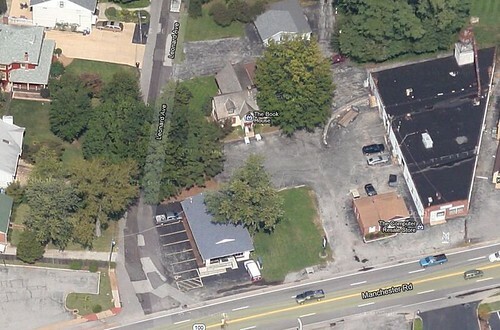 This location is just a few houses down the block from 6044 Cates, an LRA owned house that I posted about in 2008. 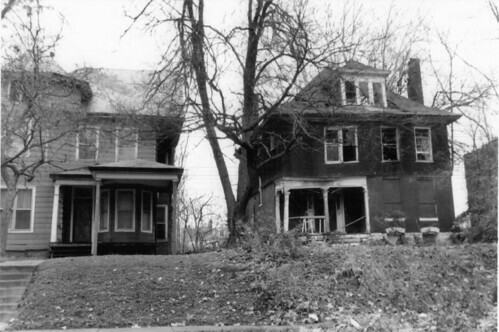 The Preservation Board denied demolition of 6044 once, but a year and a half later granted approval after LRA had made no real attempt to sell the property and neighbors were tired of living next to a vacant deteriorating house. Just east of 6044, the another home at 6036 Cates was demolished in 2005 after being vacant since at least 1993 according to City records. Despite these loses, this block of Cates as well as the other two streets in the district, Clemens and Enright are all very stable blocks and with the exception of a few isolated vacancies, are lined with beautiful homes in good condition. 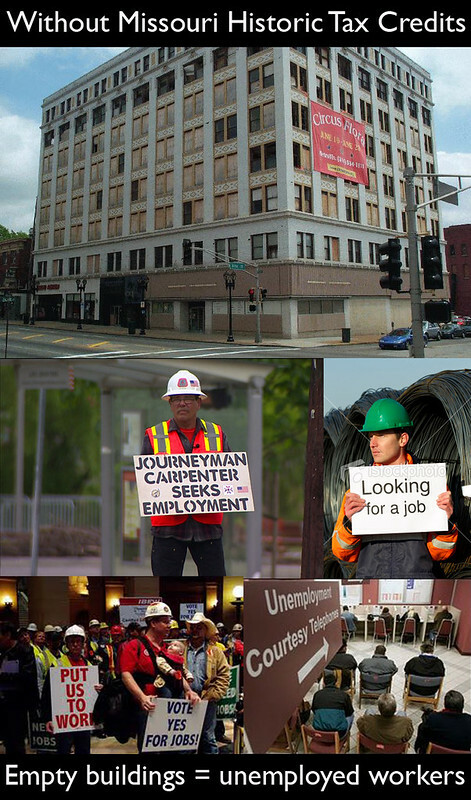 Historic Tax Credits: Its About JOBS! 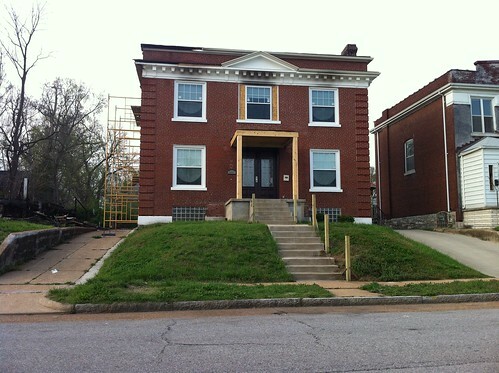 As many of you are well aware, the Missouri Historic Rehabilitation Tax Credit program is under threat of a severe cut which is being proposed by Missouri's legislators. Senate Bill SB 120 proposes to reduce the current $140 million cap on Missouri Historic Tax Credits to $45 million, less than a THIRD of the current limit! This would effectively bring historic rehabilitation projects in Missouri to a standstill and cost thousands of jobs at a time when we are trying to re-grow the economy. SB 120 has passed out of the Senate and is currently being taken up in the House, where it was referred to the Economic Development Committee. The committee can make amendments to the bill. Now is the time to act and call members of the committee as well your own Representative and Senator to urge them to remove the reduction in Historic Tax Credits. Committee member phone numbers can be accessed with the link above. To look up your Representatives phone number click here, and your Senator here. Please take a few moments to make some phone calls to help prevent this devastating cut to Missouri's most successful tax credit program that has become a model for many other states, including Nebraska which is poised to start a state program this year. Each call only takes about 30 seconds and staffers in each office are keeping count of the number of calls that they get, so each call is important! Tomorrow Downtown St. Louis and T-REx are having a calling party from 4:00 - 6:00 pm at the T-REx offices on the 12th floor of the Railway Exchange Building - 611 Olive Street, above Macy's. Please RSVP on the Facebook event page, which has a much more information. See below for some talking points. Missouri Historic Tax Credits have produced 43,000 jobs, according to an independent study by St. Louis University —more than any economic development program in the state’s history. Historic Tax Credits benefits all Missourians. To date, over 80 communities statewide have taken advantage of the HTC program to revive depressed, both rural and urban. 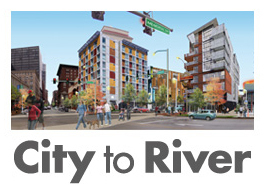 Unlike other tax credits, $4 must be invested in an HTC development project for months or years while development is planned and the renovation work progresses. The renovated building must be ready to open and the state must certify the completed project before the before a single dollar of tax credit is issued. According to latest figures from the state, Historic Tax Credits generate $1.78 in state personal income taxes, sales taxes, corporate income taxes and miscellaneous revenues for every dollar of tax credits issued.